Glass industry professionals in Houston are familiar with “bullet proof glass,” but there is not actually a glass that can truly resist all bullets. Therefore, people in the industry prefer to call it “bullet-resistant glass,” as it is manufactured to keep bullets from fully going through. 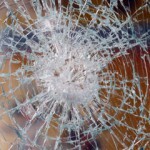 How does this bullet resistant glass work in auto glass applications in Houston? Regular glass is at a disadvantage because it cannot bend and absorb the oncoming energy of a fired bullet. This allows the projectile to travel easily through the shattered glass. Bullet-resistant glass, on the other hand, is made with laminated glass or polycarbonate thermoplastic, and it is responsible for providing extra protection in a large number of applications. Glassmakers manufacture bullet-resistant glass by bonding several layers of laminated glass sheets with ethylene-vinyl acetate, polyurethane or polyvinyl butyral. Military vehicles have been manufactured with this type of glass since World War II. Once constructed, it is extremely heavy at 100 to 120 mm thick. The other option glassmakers have is to place polycarbonate thermoplastic between two layers of standard glass. The plastic makes the glass “impact-resistant.” This means that it will flatten a bullet so that it is less likely to pass through the materials. At 70 to 75 mm thick, this glass is 10 times thicker than standard glass. It is also very heavy. When someone fires a bullet at a piece of glass containing polycarbonate thermoplastic, the ammunition’s energy is forced to move sideways amongst the layers of glass and plastic. At this point, the energy is no longer a united force as it travels across a large area. This allows the material to absorb the energy at a fast rate. Therefore, if the bullet manages to penetrate the glass, it will not have the strength to do very much damage to what is on the other side. 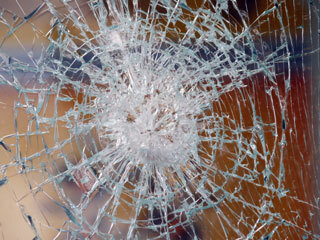 Manufacturers of bullet-resistant glass can even make one-way bullet-resistant glass. This type of glass resists bullets that are fired from the outside, but it allows people on the inside to effectively fire at their attackers. Bank armored vehicles often have one-way bullet-resistant glass for this purpose. Glassmakers construct one-way bullet-resistant glass with a brittle layer and a flexible layer. The brittle layer is placed on the outside so that when this glass shatters, the bullet’s kinetic energy is absorbed and dispersed to a wider area. The flexible layer that is located on the inside prevents the bullet from making its way through. When the guards fire at those who are shooting at them, their bullets meet the flexible layer first. This does not stop the bullet because the energy is concentrated in a smaller area. The flexible layer causes the brittle layer to shatter so that the bullet maintains its momentum and has the opportunity to hit its target. Many establishments have security glass that protects customers, students and employees from external dangers, including liquor stores, post offices, banks, government buildings, jewelry stores, check cashing stores, convenience stores and miscellaneous retailers. At Apple Glass, your safety and security are our biggest concerns. If your windshield has been damaged, this can compromise the structural integrity of your vehicle. In this instance you need to contact our Houston professionals because windshield replacement is required for the safety of you and your family. We can also perform glass repair at your Houston or The Woodlands home or commercial business. When you contact us, we will come to your location, inspect the property and determine what you need to ensure the safety of everyone on the premises. Most importantly, we will do it at a price that you can afford. Call us today for a quote. This entry was posted in Bullet Resistant Glass and tagged Auto Glass Houston, Glass Repair Houston, Windshield Replacement Houston. Bookmark the permalink.